Dining room buffet: Use a credenza to hold plates, trays, food accessories and more. It is also a great place to set serving dishes instead of overcrowding the table. TV console: Whether your tv is mounted or you need something to set it on, a credenza would make a perfect console by giving the room a focal point as well as plenty of dvd/game storage. Craft or game room storage: Hide all of your balls of yarn, scrapbooking accessories, paint supplies or kids’ toys and games in the multiple drawers and cabinet space. Entryway or foyer: A credenza would be a great place to display pictures and keep your keys. It would also add style and make a good first impression on your guests. Bedroom console or vanity: Store you clothes, accessories, makeup and more! A bar! For those of you who like to imbibe, it could display bottles, glasses, an ice bucket and all the ingredients to your favorite drink. Home Office: Don’t forget what it was originally intended for! It is still a great place to keep important documents, office supplies, and your printer. Think of all the possibilities! 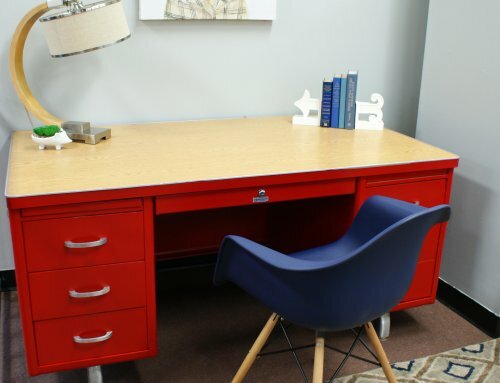 A credenza would make a perfect DIY project for any space. Visit our Pinterest page for some great tips on painting and refinishing furniture. For more DIY ideas keep checking back every Friday!